When he isn’t in the Moab area, Jeff Gutierrez leads trips in Alaska for the national outdoor recreation outfitter REI. 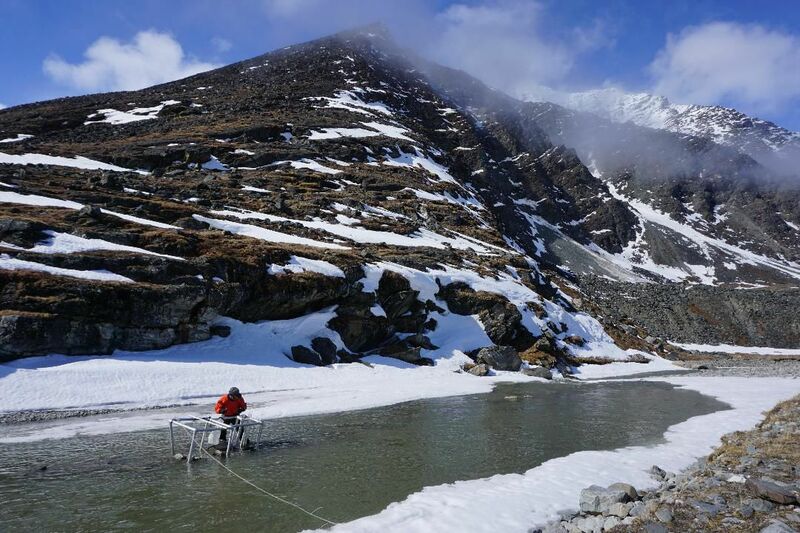 He recently explored the Brooks Range in northern Alaska with researcher Chris Benson. “It was the farthest out that I’ve ever been in my life,” Gutierrez said. Benson, who has worked in the Moab area since 2005, has been packrafting wild glacial streams and encountering herds of migrating caribou as he has carried out his graduate research at the range. The presentation, with stories and data from Benson and Gutierrez’s trip in spring of 2018, begins at the library at 6 p.m.
“It was the most intense adventure that I’ve been on — it was like full-on expedition, for sure,” Gutierrez said. Photos, film, charts and graphs illustrating the data they gathered during their expedition are being included in the presentation. Part of the presentation will explain how Benson’s graduate research on lake sediments in the Brooks Range is helping to “reconstruct the paleo environment” to better understand the climate. Benson earned his master’s degree in geology from Northern Arizona University this past May, where he analyzed sediments in Lake Peters and Lake Schrader for his thesis. Detailed weather records have been kept for only about 150 years. To look at the “big picture,” the scientists piece together what the climate looked like before modern observations. This reconstruction of ancient weather and climate patterns helps to determine a baseline with which to compare contemporary data, and contributes to the development of quantitative models to help scientists and land managers understand and prepare for the effects of climate change. The information is of particular interest to the managers of the research site. Lake Peters and Lake Schrader lie within the Arctic National Wildlife Refuge (ANWR). In 2017, a federal bill that overhauled the tax code also opened parts of the refuge to oil and gas drilling leases. If energy development in the area proceeds, the landscape and the watershed will likely see impacts from the change. Benson said his team has also been involved in installing stream gauges and weather stations in remote areas and in measuring glaciers with ablation stakes. Aside from the science data, Benson and Gutierrez are eager to share their personal stories — the challenges and joys of the journey — as they traveled between 30 and 40 miles into the backcountry with their packs. They carried not only their necessities for travel and survival like food, winter camping gear, rafts, personal flotation devices, drysuits, and helmets, but also scientific equipment including stream gauges and a laptop. When: Thursday, Jan. 31, from 6 to 8 p.m.